Today’s guest post is from Happy Hubby. I just finished reading “The Righteous Mind: Why Good People Are Divided by Politics and Religion” by Jonathan Haidt. Hawkgrrrl has mentioned items from this book a few times (here, here, and here). Many of you will probably at least heard about the metaphor put forward in this book where he postulates make we make many moral decisions – that of being an elephant and the elephant rider. The very brief explanat ion would be that our subconscious mind makes the moral judgement (the elephant moves a certain direction) and then afterwards looks for justification for the decision (the rider of the elephant then makes up explanations as to why the elephant made the move it did). He also mentions that the elephant rider is analogous with the POTUS and his press secretary. The press secretary is always going to put a positive spin on the president’s actions – even if personally they think it was a very bad decision. Even though it is a basic building block Haidt uses for theories, I am not going to focus on that analogy in today’s post. I will say that I think the book would be good required reading for everyone in the US right now. The Righteous Mind really does a good job explaining, not just why we have a growing political rift in the U.S., but why the disdain between the two parties is escalating so much. The book has both politics and religion in the subtitle, but most of the book is focusing on politics with one chapter covering religion. The title of the chapter on religion is descriptive of his thesis that “Religion Is a Team Sport.” He calls it short sighted to look at religion as just a reaction between believing something and then that causing a person to do something. Borrowing from Emile Durkheim from over 100 years ago Haidt emphasizes that belonging to a group is just as key and belonging and belief, doing, and belonging all interact with each other in a religious experience. 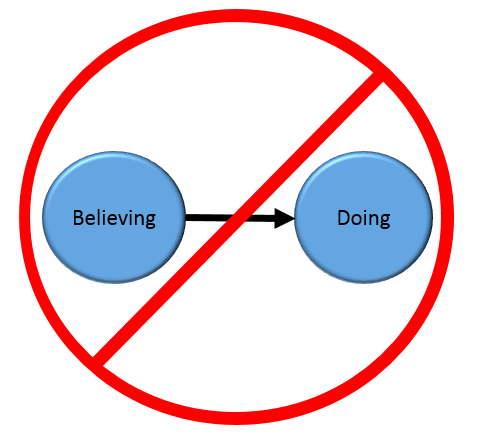 Haidt emphasized that beliefs alone do not generate the most action (doing) alone. To get the most action, there needs to be belonging. He also claims that belonging also drives belief. I certainly have seen that individuals within the church that have different primary motivations. I know of some that just LOVE to read, ponder, and expound on scripture but are not often seen when the service projects show up. And some people are just the reverse. The person who can’t remember if Jacob is in the Book of Mormon or Old Testament, may be the first to sign up for every service project. And there are some that have a deep need for a community. I have heard of many that have left the church and they state that they deeply miss the community aspect of the church. So I can see examples that tend to support the model Haidt proposes. It sure seems like such a pitch for others to join such a group is going for a niche market! I would comment that this is certainly something that Mormonism generally does well for those that fit well. I agree with some that we could do a bit better and bring back things like roadshows. 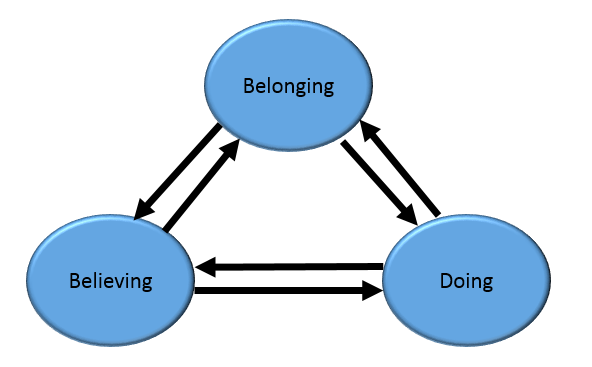 But the communal example does seem to support how belief and belonging work together to drive action in his triad model. The findings of other researchers agree. Putnam and Campbell included on one of their surveys a long list of questions about religious beliefs (e.g., “Do you believe in hell? Do you agree that we will all be called before God to answer for our sins?) as well as questions about religious practices (e.g., “How often do you read holy scripture? How often do you pray?”). These beliefs and practices turned out to matter very little. Whether you believe in hell, whether you pray daily, whether you are a Catholic, Protestant, Jew, or Mormon … none of these things correlated with generosity. The only thing that was reliably and powerfully associated with the moral benefits of religion was how enmeshed people were in relationships with the co-religionists. It’s the friendships and group activities, carried out within a moral matrix that emphasized selflessness. That’s what brings out the best in people. We certainly can see events like the Willie and Martin handcart companies as something that strengthened some people’s commitment or faith. There were also a few for whom this trial had the opposite effect. But the rule of “tighten the screws and it gets harder for fence sitters” holds some truth in organizations. As previously mentioned, Haidt spent most of his book talking about examples from politics. He admits to being a liberal, but he can dole out the critique and praise of several political parties. He also dives into some conservative writings that helped him better understand conservatives and their motives; he developed an unexpected admiration for what makes them tick. He goes on to present some graphical representations of 6 different things that people find important or as he calls them “taste receptors.” He calls this the Moral Foundations Theory. 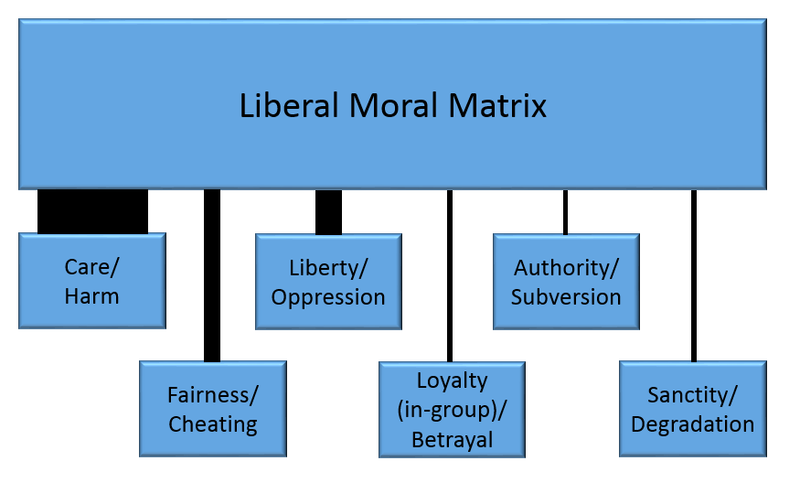 He graphically diagrams Moral Matrices for Liberals, Libertarian, and Conservative with the width of the connection indicating the importance of that that moral. 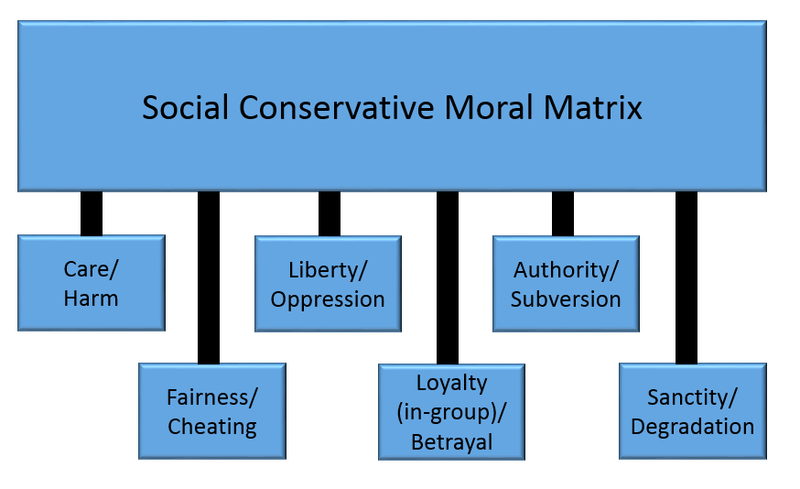 The Liberal Moral Matrix has the Care/Harm as the most important with a very thick connecting line (the term “bleeding heart” liberal comes to mind). This is followed by Liberty/Oppression which is just a bit smaller, then an even thinner line for Fairness/Cheating. There is only a very thin line connecting Liberals to the other 3 morals of Loyalty/Betrayal, Authority/Subversion, and Sanctity/Degradation. 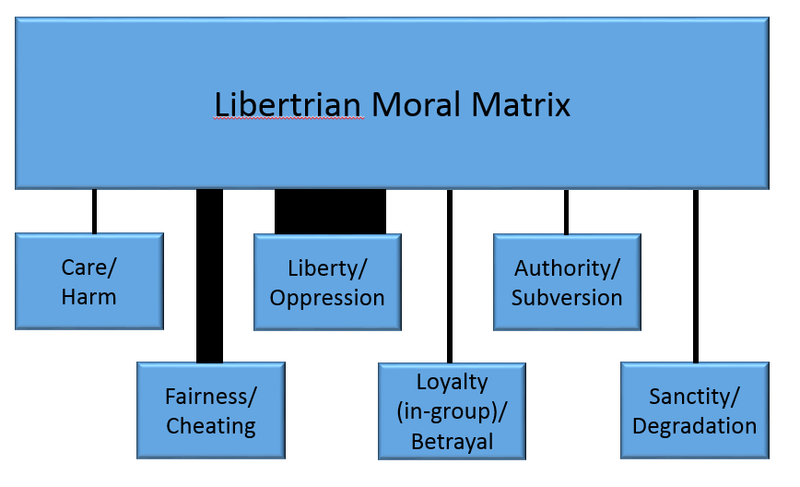 The Libertarian Moral Matrix is a bit simpler with a very strong connecting line to Liberty/Oppression (no surprise given the name). Then a moderately thick line to Fairness/Cheating. There in only a thin connecting line to all other morals. The most interesting Matrix is that of Conservatives. Haidt suggests that conservatives actually have a moderately thin connecting line, more or less equally to all 6 morals. I suspect that the readership of Wheat & Tares has a higher percentage of liberals than does the Mormon church as a whole. It can be uncomfortable to be in a group where your views are not shared. It can be much worse if your views are not only not shared, but are hated or considered morally wrong by some. Politics describe our values, and feeling that your values are at odds with the vocal opinions within an organization makes it more difficult to participate. Just as with politics today, within the church there is much need for individuals to stop retreating to their respective corners, but instead to try to understand others and to accept and allow for differences. Does Haidt put forward an accurate description of political and religious ideologies? Are we going to come together or farther apart in the church and politically in the US? Next Next post: An Exercise in Humility or Grooming to Obey Orders? He has becoming heavily invested in reigning in over the top SJW rhetoric and demands – to so far as comparing them to a psychological disorder. “I’m triggered” and “I need a safe space” and “I need protection from microaggressions” are all psychologically dysfunctional concepts except when used as a very brief time out to discover and internally resolve the cause of one’s trigger, otherwise trigger warnings, safe places and protection from microaggressions simply reenforce one’s infantile victimhood. To be healthy these things are to be faced not avoided. It is true that changing the church isn’t a path to nirvana but some changes create enough space to reduce pain felt by the less than TBM devout. The church doesn’t need to be anything like what it currently is there is plenty of room for change and improvement; Behold, this is my doctrine—whosoever repenteth and cometh unto me, the same is my church. Whosoever declareth more or less than this, the same is not of me, but is against me; therefore he is not of my church. I’ve had to learn the hard way that wanting the church or any other group of people to change is not going to work (although if enough people want the same thing, the church does appear to react). Peace for me came from letting the church (or whomever) be what they are/value what they do, without their self-definition/values encroaching on my own. All of which demonstrates the bind that the church is in at the moment. How does a conservative church (speaking of the paradigm, not politics) convert those of us with liberal value systems? Or in more blunt speak, how does the church convince me that things like authority and sanctity are in any way important? It would he interesting to ask this of Haidt. I also wonder what percentage of those that leave the church fall under the liberal or libertarian value system. Conversion is supposed to be from sinner to saint, not democrat to republican. Either a democrat or a republican can repent of his or her sins and find joy in a life of faith, hope, and charity, without changing political parties. A person going to church for his or her salvation and wanting to help in the salvation of others, wanting to stand with God and among fellow saints, will find more happiness there than the person who goes expecting the company of political friends. The church cannot convince anyone that sanctity and authority are important. But if you ever come to that realization, lehcarjt, you might find happiness there. Even if not, there are other attributes of the church that can help one find happiness. Why are sanctity and authority important ji? I cannot convince anyone that sanctity and authority are important. Jl – Take a look at my comment .again. I think you might have missed entirely what I was saying as I’m not talking about Rep vs. Dem. Take a look at what I said with liberal and conservative being defined by the graphs in the posting. I’m trying to link to these differing value systems. So my question is about how a church with very a very conservative value system can / can’t work for those with liberal value systems. Interestingly, one of the things Haidt explores is that these value systems are more innate than we expect and that both the conservative and liberal have strengths and weaknesses. I think Howard got what I was saying as he summed up the idea. The church places a huge emphasis on authority and sanctity. But for people whose value system is focused on harm/care and fairness, there isn’t as much the church has to offer. Or do you see it differently under Haidt’s paradigm? I will add that none of this has to do with happiness. To be honest the most miserable time in my life was when I gave the church 100%. Letting go of that brought me a huge amount of happiness and peace like I’d never experienced before. Now that doesn’t mean the same has to be true for you (under, I’m going to assume, a fairly conservative value system within yourself that makes sense). It’s wonderful that so many people do find happiness within the church. But not all do and in a sense it is that difference between the two groups that interests me in exploring when it comes to Haidt’s paradigm. The people who really want coddling are the ones who want to create a world where people like me don’t exist. If the church is just another social club, then your approach is exactly right. But if Jesus Christ restored it and Joseph Smith was His prophet, that faith might reasonably affect one’s approach. One need not be completely at peace with every facet of church culture to find happiness in the church. If one has faith in the Savior and the restoration, and he or she doesn’t value authority and sanctity, he or she can find other facets of church culture to lean on. It’s a matter of choice. For me, since I most sincerely believe in the Savior and in the restoration, I want to join with the church even if I don’t like all aspects of church culture. Thanks for the comments. I find them interesting. At this moment I feel they are to a large extent written off as I don’t think leadership has found a way to do this or are willing to do this. Sanctity cannot be rationally defined without resorting to a word like holy which also cannot be rationally defined. So this attempt at definition just becomes circular nonsense. Words like sanctity and holy are used because they are assumed to be above reproach. It’s simply a defense, if I label my belief as sacred you cannot seriously question it without becoming socially unacceptable. If my church leaders claim authority I cannot seriously question them without becoming socially unacceptable. Authority is either backed up by threat of enforcement which is further backed up by actual enforcement (police, military or church discipline) or by respect. If I fear or respect God or both he has authority over me. The same goes for Q15 and by extension other church leaders. Respect is earned, fear is imposed, it’s the same old carrot or stick brand of motivation. Authority and sanctity are each a sleight of hand used for audiance control. Now it can be argued that this has been done in your best interest or that humility can be learned by bowing to authority and sanctity but I don’t think you can rationally assign any beneficial meaning beyond this. If anyone believes they can or can better rationally define authority and sanctity I would love to read it here. Not while schools on. I don’t know about the US, but my kids find/found it hard enough with the church commitments they already have on top of school without adding in anything else. For myself I feel very uneasy that more commitments to church mean less involvement in my local community. Might work in places where your local community is your church but that’s not the case here. By the above definitions I think I must be liberal. I look at loyalty and authority and see harm. Amen on “nothing more during the school year”. I live in the US but way outside the Mormon corridor. But with early AM seminary my kids are terribly sleep deprived. Any kid that is in an extra curricular activity will have months of unrealistically hard schedule. I have even started tracking my kids seminary attendance very close so that they can strategically skip about a day per week and internationally sleep in one day of the week during the middle of the week.